We offer our prefinished hardwood stair treads in spray booth clear coat and stain finishes. We use industrial spay guns and a full booth system, to achieve a long lasting, high quality finish to show off your hardwood stair treads true beauty and highlights. We have been told by many of our customers that the finished product that our finish team puts out is above furniture grade in both quality and standards. We are very proud of the spray finished stair parts we produce. Yes, we do custom stain finishing to match your hardwood flooring or your kitchen cabinets. We also stain to Minwax® color pallet... which offers customers 25 wood tone colour choices: ( view the Minwax® color pallet here ). DuraSeal Polyurethane 350 VOC is a clear oil-based, Low VOC, durable protective top coat finish that we use on all our prefinished stair treads. It specially formulated for hardwood floors ( so, if it's made to be used on hardwood floors... then it's tough enough to meet the demands of your staircase ). The DuraSeal product line includes stains with a high solids content for deep color and exceptional sealing action, and transparent top coat finishes that withstand brutal wear and punishment. DuraSeal products have become the number one choice among flooring contractors and stair builders. ( view DuraSeal Polyurethane 350 VOC here ). That many stair parts suppliers charge more for Polyurethane spray finish top coat, as it's a higher end / more expensive product when compared to Lacquer finishes. Polyurethane is also the #1 selling top coat finish in the wood industry and at building supply stores Canada wide. Our top coat finish "DURASEAL POLYURETHANE 350 VOC" is a commercial grade version of MinWax Polyurethane. The benefit to the consumer is 2 fold, not only is it very high quailty... it is also going to be easy for future onsite touch ups and/or re-coating; as a can of MinWax Polyurethane right off the shelve from your local hardware store is all you need: ( View Minwax Fast-Drying Polyurethane ). MinWax has a great online resource guide to clear coat finishing, right from the editors of "This Old House Magazine" click here to view: Minwax Online Guide To Clear Coat Finishing. Note: we recommend the Minwax Fast-Drying Polyurethane indicated above - its web page has full "Product Details", "FAQ" & "Usage Directions" listed in a user friendly layout. We use Dulux Diamond Interior Acrylic Paint for our white white finish coatings, it is a revolutionary paint, with a unique formula of ceramic microspheres and advanced stain resistant technologies that surpasses the performance of traditional interior acrylic paints. Its unique blend of rheology modifiers improves flow and levelling, along with outstanding hide, increased durability, stain resistance and quick-drying characteristics, results in superb application. Ideal For High traffic areas and where there is a need for a washable finish. 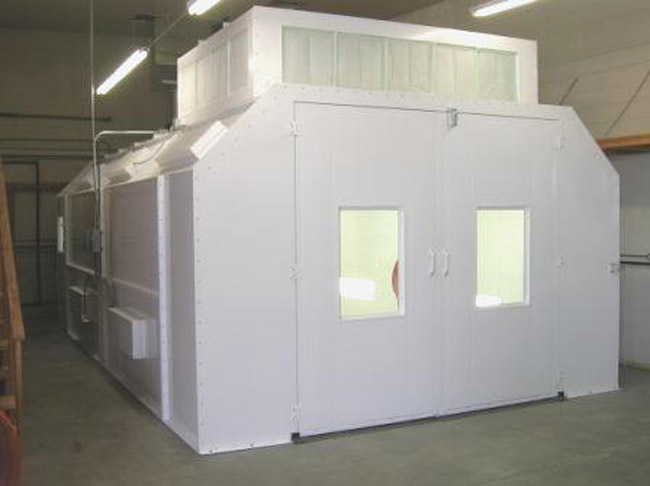 Suited for home, office, commercial or industrial environments. ( view Dulux-Diamond product brochure here ). The below photo is an image from our showroom of 2 stair treads we custom stain finished. 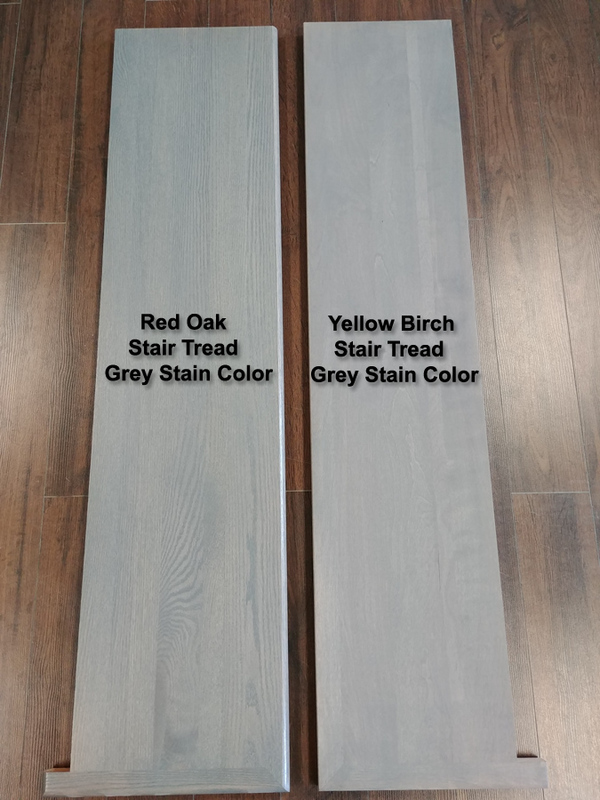 The picture shows ( you the consumer ) the overall face look of a red oak stair tread -vs- a yellow birch stair tread when finished in the same light grey custom stain color. Please Do "LIKE US"... It's Appreciated - Thank You!